Wissy's blogspot: Tacky or cool? I love architecture. I love unusual buildings both modern and old. I'm no expert, I just like what I like. I also like diversity. When in Porthcawl I noticed two buildings only a few yards from each other. Both possessed character but in quite different ways. 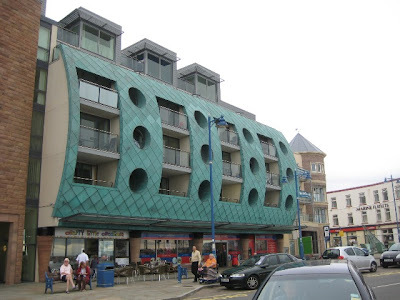 The first building is a block of apartments called Esplanade House which is right on the promenade by the seafront. It's architects won a major Welsh housing award in 2006. The judges praised it's mix of "humour, charm, intellegence, populism and solid architectural pragmatism". The locals hate it and have dubbed it "the bottle bank! The "bottle bank" in Porthcawl - tacky or cool? I personally haven't made up my mind yet. It's prominent port hole openings and bulging facade seem to completely ignore the cream coloured facade of Porthcawl's promenade, but I don't quite hate it. It has something about it. The building is attention grabbing and prominent and has created alot of debate and discussion since it was built. Maybe that is what the architects intended and Porthcawl needed. The other building is more traditional. It is The Grand Pavillion. 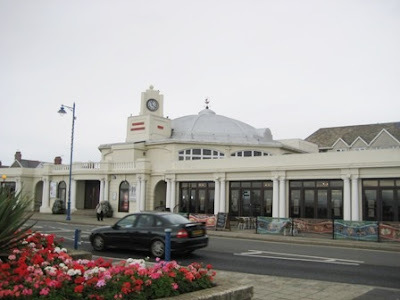 Built in 1932 it dominates the seafront and boasts a classic thirties facade and distinctive octagonal dome. Originally a dance and concert hall in the war years, it is now a theatre and plays an important part in the town's social life. I adore art deco buildings like this, but maybe this too caused dismay to the traditionalists when it was first built. The imposing facade of The Grand Pavillion. 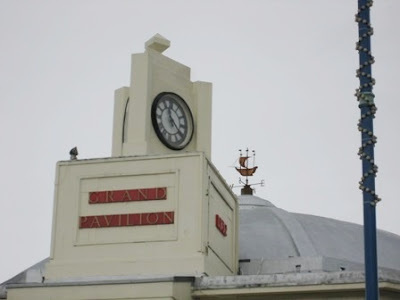 The octagonal dome and galleon weather vane. Croatian flag for your Flag counter, greetings frim Croatia.